.NET provides many drawing classes via System.Drawing namespace. Prior to ASP.NET it was difficult for an ASP developer to create and emit images (jpg, gif etc.) to the browser at run time. Combining ASP.NET and System.Drawing one can develop attractive charts. This code sample shows how to create bar and pie charts using the technique mentioned above. What the sample application does? 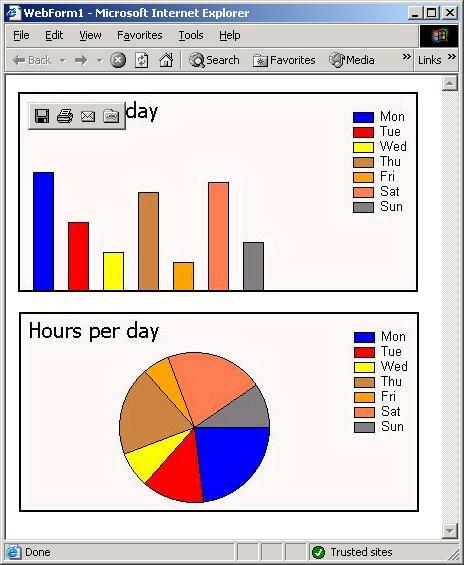 ChartHost.aspx: This file contains two image web controls displaying bar and pie chart.